As I can't afford a Celine, nor anything near that price range, I have been on a quest to find a satchel that is not only beautiful and well-made, but also budget friendly. I've considered Kate Spade, Tory Burch, and J.Crew. 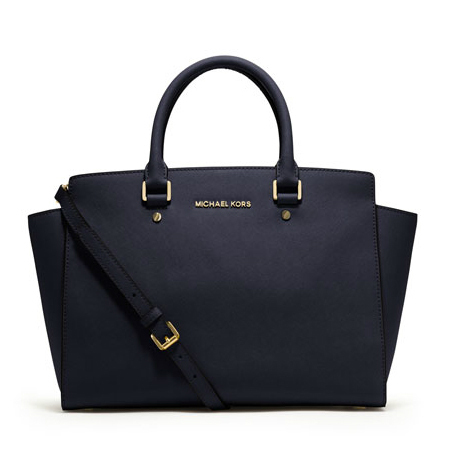 However, this one by Michael Kors definitely fits the bill! Made of saffiano leather, it won't show marks or get scuffed up quite so easily. I haven't pulled the trigger yet, just looking around really. But isn't she lovely? That bag is so beautiful. Hope you end up purchasing it. Yes, its so lovely! Actually I think i'd prefer that, the Celines are so beautiful but they're starting to be very common now and there's so many fakes around, too. Not what you want if you're paying thousands of dollars! I like that kind of shape bag though. I just got a white Pashli recently. It's a bit more wallet friendly than a Celine is, maybe you'd like the black of those? I love the pashli! It's such a beautiful bag! I remember admiring it back in the fall. You're so lucky to have it in white! oooo, stunning! I say you should go for it! Amazing bag! Definitely very classy and timeless style. I'm not sure I've seen the coach Candace. They are really stepping it up these days though, I love their legacy line! It is so, so pretty...go for it! its too cute id say go for it!!! I am obsessed with that bag---love it in black and the kelly green color! I can't justify it since I got my LV...and I will need to buy a diaper bag...but it is tough to resist! That's so funny because you know I want the neverfull! I want both :) the neverfull is more of a tote, while this one appears more structured like a satchel. Both are gorgeous! Oh she's a beauty!! I'll be on the hunt next week while I'm in Vegas. Any chance you'd want to do a guest post for me?!? Yes! I would love to :) I'll leave you a comment on your blog in case you don't see this. I think this is so gorgeous. Classic and chic and perfect to go with anything. I work at Macy*s, on my breaks I go over to the MK section & just drool over this. Coach has similar one too, & its less, but I would so go with the MK one. If you can wait until May, Macy*s will have their F&F sale May 1ST, 25% off. Oooo, you work at Macy's? Fun! Well at least I hope it's fun ;) Thank you for the advice on the F&F sale. I will definitely try to take advantage of that! love this new MK bag! I need to get the black one as my everyday work bag! Oh I love that bag! Micheal Kors is too cool!